Rian Leaum Sammanasak Luang Phor Kliang Wat Non Kaed BE2553. Nur Fabart. Serial Number 606. It mades for Luang Phor Kliang’s 104 years old birthday. Luang Phor Kliang born on 10th October BE2451 and passed away on 6th January BE2562 at the age of 111 years old. Phra Kring Srinakorn Archan Sawai Sumano Wat Rachanada BE2516. This batch of amulet only has 1 type of material which is Nawa and made 2516 pieces only. The mixture of the materials was done according to the formula of Wat Suthat which Archan Sawai Sumano had fully mastered. Phra Kring Srinakorn were sponsored by Khun Wukten Taychabyboon, who was the owner of Srinakorn Bank in celebration of his 60th birthday. Archan Sawai Sumano of Wat Rachanada, who is highly respected by Khun Wukten Taychabyboon,was invited to consecrate this batch of Phra kring amulets. Archan Sawai inscripted Yant on a piece of 15 grams gold plate and 9 other popular monks during that time were also requested to inscript Yant on it. After the above ceremony held by all the great masters, Luang Phor Toh of Wat Pradoochimplee was requested to bless these amulets for one more time at Wat Pradoochimplee. It won 2 times No2 Placing in Thailand Grand Amulet Competition in year 2013. Luang Phor Thuad Archan Nong Wat Saikow BE2540. Gold Takrut, made 79 pieces only. Original condition. It won No1 Placing in Thailand ChaengWattana Grand Amulet Competition on 29th October 2017. Attached with Gold Waterproof casing. Rian Roon 9 Luang Phor Fun Wat PaUdomSamPorn BE2513. Super champion condition. 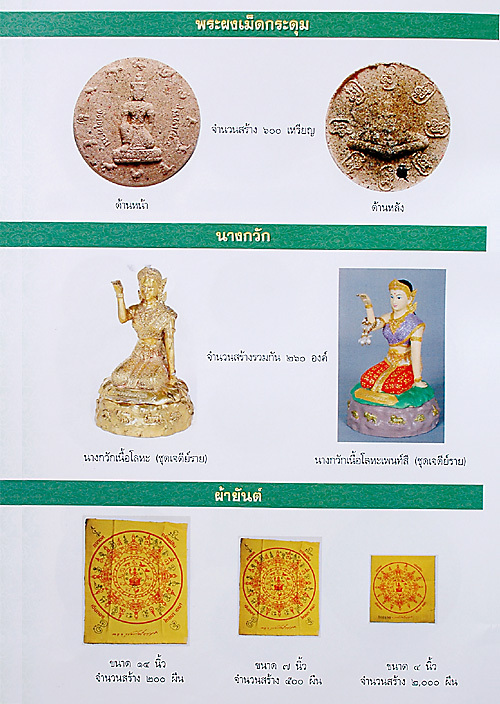 It won No1 Placing in Thailand Sukhothai Grand Amulet Competition on 14th December 2014. It won No4 Placing in Thailand BITEC Grand Amulet Competition on 30th September 2018. Attached with Solid Gold Waterproof casing (Cost around 17,000 Baht). Phra Puttha Sihin Nur Mai Takien Wat Mahathat BE2530. 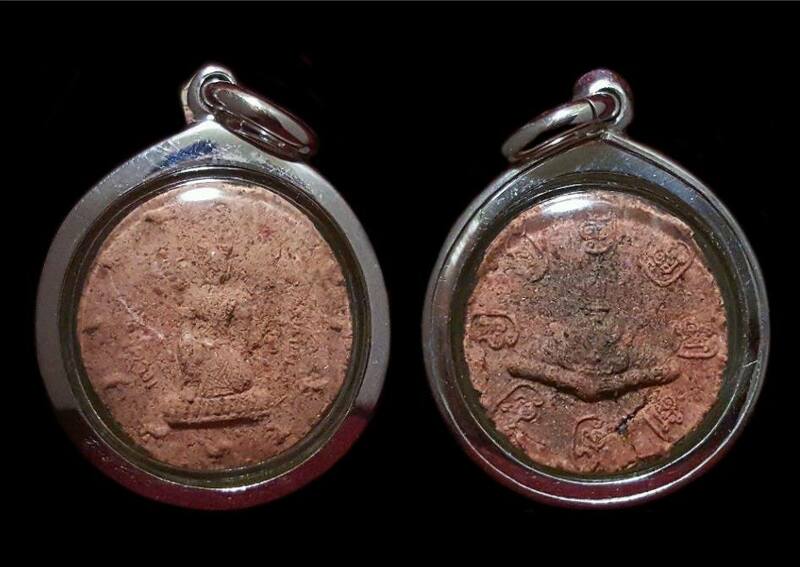 This amulet blessed together with First Batch Jatukam Ramathep in the same ceremony by Archan KhunPan and others, such as Archan Jeang Wat Donsala, Archan Singern Wat Donsala, Phra Kru Kachat Wat Donsala, Archan Kien Wat Thong Lor, Phor Than Kling Wat Thalunthong, Luang Phor Sung Wat Don Tro, Luang Phor Chan Wat Thong Fuer, Luang Phor Mui Wat Prakam, Luang Phor Kloy Wat Pukaothong, Luang Phor Glun Wat Kao Or, and many others. First Batch Rian Luang Phor Chob Wat PaSamMaNokSorn BE2514. Nur Alpaka. Very rare in market. It comes with Samakom Authentic Certificate. First batch Pidta Mahalapo Luang Phor Plien Wat Aranyawiwake BE2541. Nur Ngern, Serial Number 188. It comes with original temple box. 4th ceremony: 25th September BE2545, blessed at Wat Mahathat, Nakhon Si Thammarat.